The primary objective of chiropractic care is find and reduce the underlying cause of your headache. Headaches are common, but they’re not normal. Pain relievers of various types are the most common approach to headaches. In our practice we take a more natural approach. 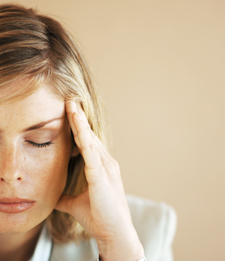 Our objective is to find and reduce the underlying cause of a headache. A common cause of headaches is from spinal bones in the neck that aren’t supporting the head properly. You might not notice your reduced ability to turn your head. But these vertebral subluxations affect nerves, muscles and even the blood supply to your head. Our thorough examination detects vertebral subluxation patterns that could be causing your headaches. If vertebral subluxations are present, you’re likely to benefit from chiropractic care. Click here to try our at-home range of motion test. Some are surprised to learn that their headaches are being caused by problems in their lower back! The upper spine compensates, shifting the head off center, causing headaches. While we can’t guarantee results, we have a high success rate with patients who get headaches. Give us a call. Let’s sit down and discuss your unique situation. Is the spine the source of all headaches? Not necessarily. The three most common causes are physical trauma, emotional stress or chemical toxins. Sometimes there may be a combination of factors. Our examination process helps identify the most likely cause(s). There are three basic causes of subluxations. Physical causes could include slips and falls, accidents, repetitive motions, and improper lifting. Emotions, such as stress, anger and fear can be the cause of subluxations. Chemical causes could include alcohol, drugs, preservatives, pollution and poor diet. The pain you feel is real. And psychological sources of pain are common. However, this “diagnosis” is often the last resort of health practitioners who have exhausted their possible explanations of the cause of your problem. In these cases, we’ve often found that undetected subluxations are likely culprits. How many visits will it take? Some patients enjoy results quickly. Others notice a slow decline in their symptoms after several weeks or longer of chiropractic care. It’s impossible to predict. If you’ve had chronic headaches for many years, improvement can take time. We monitor your progress and modify our recommendations as needed. What if chiropractic care doesn’t help? If we’re unable to find and correct the cause of your particular health problem, we will refer to other experts who may be able to help. Your health and your satisfaction are our only goal. How come my medical doctor didn’t suggest chiropractic? That’s changing. Years of prejudice and bias are giving way to research showing the benefits of chiropractic care. Attitudes are slow to change. However, as the public demands alternatives to drugs and surgery, more and more medical practitioners are referring to chiropractors. Chiropractor Website by Perfect Patients.